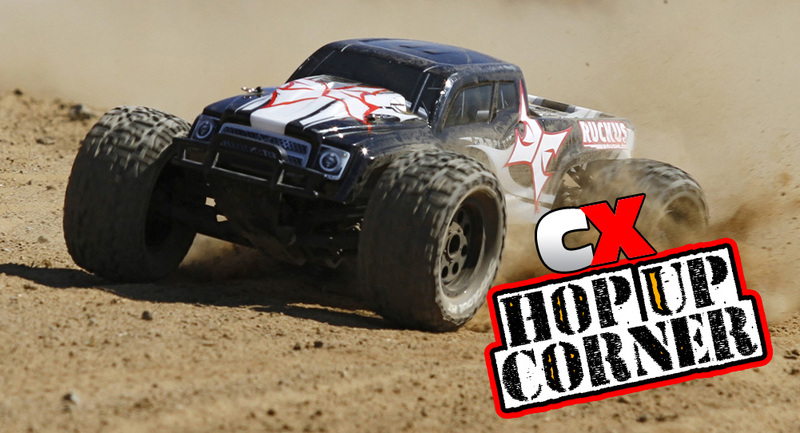 For this installment of Hop Up Corner, we’re going to check out some of the best upgrades for your ECX Ruckus 2WD Monster Truck . This is a fun truck that is itching for some upgrades – we’re converting it from a fast-moving 2WD MT to a stylish trail truck complete with sounds and lights. The suspension on the Ruckus is actually pretty good. It can take quite a bit of abuse, but two areas that eventually need attention are the shocks and the suspension arms. The suspension arms (especially the fronts) should be replaced with RPM parts; RPM Front A-arms for the ECX 2WD Ruckus and the RPM Rear A-arms for the ECX 2WD Ruckus . These suspension parts are made from RPM’s super-secret nylon concoction and are extremely durable. As far as the stock shocks, they feature aluminum bodies that can wear out quickly and lose the oil, especially if you’re one of those that likes to drive your vehicles hard! For this Hop Up Corner, we’re going to be swapping those plastic units out for a full set of aluminum replacements; ECX Aluminum Front Shock Set for the Ruckus and the ECX Aluminum Rear Shock Set for the Ruckus . 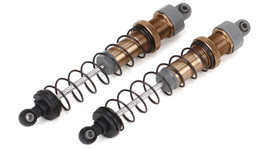 These delightful dampers will certainly soften up the ride and help keep all 4 wheels on the ground. You’re going to need that while out on the trails. In stock form, the ECX Ruckus 2WD comes with a great power system; waterproof servo, 15T brushed motor, ESC and even a battery. 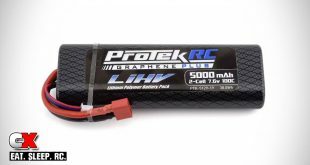 I was going to suggest a more powerful brushless system but since I was working towards a trail-truck design, more power wouldn’t necessarily be better. 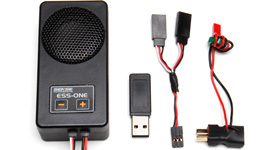 So, I opted for something a little more fun – how about installing a Team Associated ESS-One Engine Sound System ! This little box plug-and-play box plugs into an open port in your receiver and offers 25 different engine sounds to choose from – everywhere from a turbocharged 4-banger (with blow-off valve sound) to a healthy-sounding V8. There are also 20+ additional sounds like horns, sirens, etc. 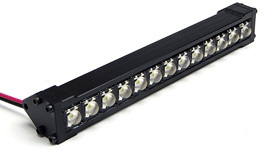 The speaker unit is 3.9″x1.88″x1.35″ and can be fitted almost anywhere on your chassis with double-sided tape. It actually revs up (and down) in unison with the throttle and has a nice idle when the truck is standing still. Definitely something to add a spark of cool to any trail truck. Since we’ll be doing some trail trucking and light rock crawling, we’re going to need to beef up the gears a bit, especially with the addition of some soft Proline tires. To achieve this, I suggest installing a ECX Metal Gear Set . 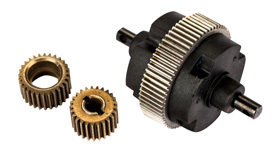 This replaces the idler gear, topshaft gear and differential gear with metal counterparts. This does require the removal of the transmission, but it’s better to do it now before the internal gears explode and you have to clean out all the shrapnel. If installed, this will also allow you to tighten the slipper clutch down a bit for maximum forward traction. To top off our ECX trail truck revive project, I suggest dropping on aPro-Line Racing 2009 Jeep Wrangler Rubicon Clear Body . This body comes clear so you can paint it however you like. It is also one of the more popular trail truck bodies out there with lots of scale details molded into the body, plus lots of aftermarket goodies that can be bolted on. 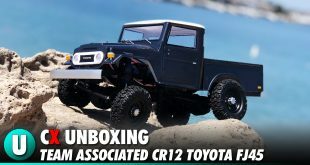 The only issue with this body is wheelbase – the Ruckus sports a 333mm wheelbase while the Proline Jeep body is good for 300mm. It actually doesn’t look that bad when mounted – just position it more to the rear and you’ll be good. 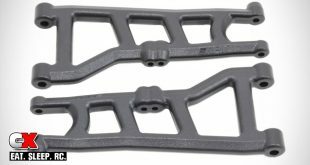 You’ll also need to pick up an extended rear body mount to make it work; I’ve heard these work pretty well: Losi Extra Long Body Mounts . Now that we have a sounds, an upgraded suspension and a killer body, we have to put a nice looking set of wheels and tires on it. For maximum trail traction, I suggest a full set of Proline hoops: Proline FaultLine 2.2 Bead-Loc 6-Lug Wheels and BFGoodrich Baja T/A 2.2″ G8 Rock Terrain Tires. 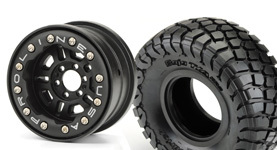 The wheels are from their 2.2″ series and use a 12-point beadlock system to keep the tires firmly attached. This also removes the need to glue the tires. 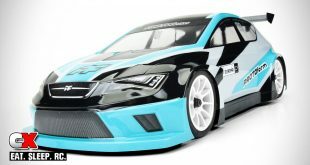 The BFG’s are new to Proline and are also 2.2″, roughly the same height as the stock tires, however a little bit thinner. This thinner profile will help navigate the trails as well as reduce the chances of making contact with the Jeep body when you’re climbing over obstacles. The BFG’s are also molded from a pretty soft compound, so be careful if you decide to upgrade your power system. While his ECX Ruckus trail truck conversion works great on a 2WD, it would also be a fantastic conversion for the 4WD Ruckus as well. Hopefully this will get you started on a great rebuild of this truck. Like to see another car featured? Shoot us a message using the form on the Hop-Up Corner Request Page and we’ll get it added to the queue! I just recently purchased a 2WD Ruckus. The front links pop off real easily. Can you please let me know if there are better replacements for them. Thank you for your time. Traxxas does offer upgrades for the links; you can find them here: https://traxxas.com/products/models/electric/rustler-vxl-tsm?t=accessories. They’ll be much more durable than the stock links and adjustable, so you can tweak the tuning for a better handling truck.